The 45th edition of the Biel Chess Festival is taking place July 21 – August 3 in Biel, Switzerland. 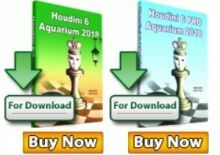 The main Grandmaster Tournament will be a category 21 event with the participation of the USA Chess Champion GM Hikaru Nakamura, the Russian top 10 player GM Alexander Morozevich, the Chinese N1 GM Hao Wang, the Chess Evolution author GM Etienne Bacrot, the newly crowned Dutch champion GM Anish Giri, and World’s top rated player Magnus Carlsen who is replacing the earlier announced Cuban GM Leinier Dominguez Perez. 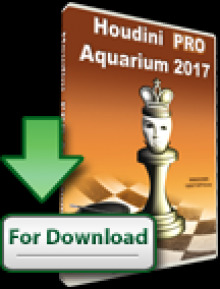 The Grandmaster Tournament will be a double round robin with classical time control, Chessdom.com will provide daily live coverage of the event. 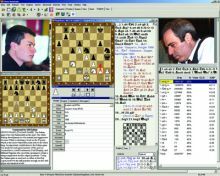 The tournament is coming shortly after the Tal Memorial 2012 and Dortmund Chess 2012, while it will finish before the Chess Olympiad 2012 continuing a great period for top level chess. The Festival also features Exhibition Blitz Tournament, Master Tournament, Main Tournament, Rapid Tournament, Blitz Tournament, Chess960 Tournament, Youth Tournament, Simultaneous Exhibitions and Chess-Tennis Tournament. The Exhibition Blitz Tournament, celebrating the 45 years of the Festival, will be held on Sunday 22nd July, 14.00 pm, as a knockout event with 8 invited Grandmasters. Playing System: Two games with 5‘+ 2‘‘/move. If 1-1, one Armageddon game with 5’ for white (has to win) and 4’ for black. 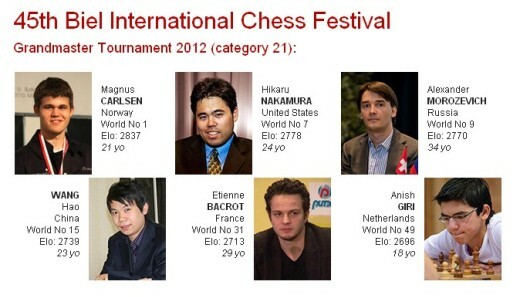 The Master Tournament will be an 11-round Swiss event, taking place on July 23rd – August 3rd, 2012. Rest day on July 29th. Total prize fund: CHF 43’000. Prizes: CHF 7’000, 5’000, 4’000, 3’000, 2’500, 2’000, 1’500, 1’200, 2×1’000, 3×700, 3×500, 4×300, 5×200, best ladies: CHF 600, 400, 300, best senior (1952-), best junior (1994+), best child (1996+), best player without title: each CHF 500, best players with Elo <2200 and <2100: CHF 500, 400, 300, 200, 100, best Swiss players (with CH-passport): CHF 1'000, 700, 500, 300, 200.